Win Kristen's new book! Register and be present at the live session of the webinar to win. So many educators think of digital citizenship as "one more thing" on their already full curricular plates. This doesn't need to be the case! 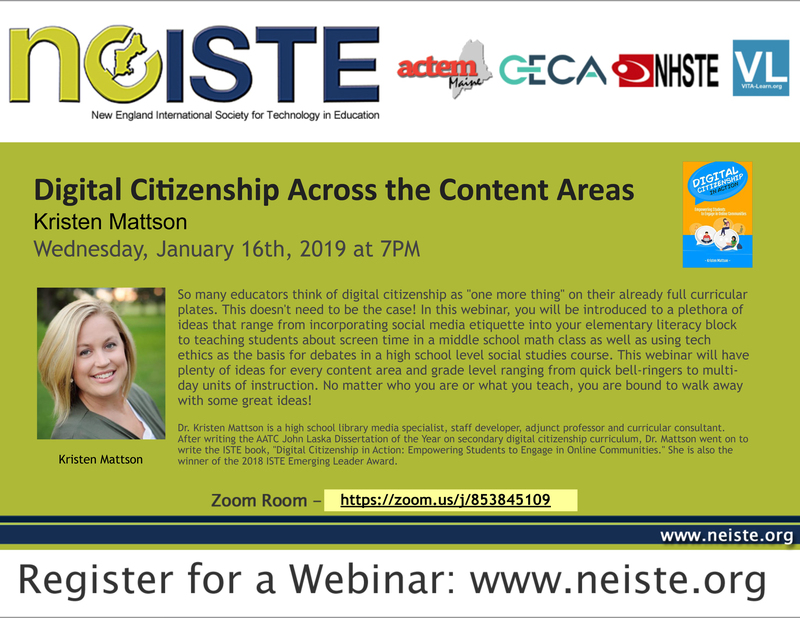 In this webinar, you will be introduced to a plethora of ideas that range from incorporating social media etiquette into your elementary literacy block to teaching students about screen time in a middle school math class as well as using tech ethics as the basis for debates in a high school level social studies course. This webinar will have plenty of ideas for every content area and grade level ranging from quick bell-ringers to multi-day units of instruction. No matter who you are or what you teach, you are bound to walk away with some great ideas! Dr. Kristen Mattson is a high school library media specialist, staff developer, adjunct professor and curricular consultant. After writing the AATC John Laska Dissertation of the Year on secondary digital citizenship curriculum, Dr. Mattson went on to write the ISTE book, "Digital Citizenship in Action: Empowering Students to Engage in Online Communities." She is also the winner of the 2018 ISTE Emerging Leader Award.